How did Christianity reach America? Well your answer no doubt would be well it was brought over here by the pilgrims. The Gospel was brought later on by the puritans and then it was brought further by different people that came after them. Well where did they come from? As we well know the Pilgrims came from central England there were several little towns in central England where these pilgrims came from and a lot of them knew one another and they decided that they must leave England because of the pressures of the government, so they went to Holland and spent approximately twenty years before they left and came to America. So let's go back just a little further, how did the gospel reach England? 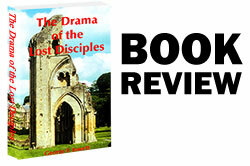 Well that's the subject that I want to introduce to you today and introduce to you this book entitled The Drama of the Lost Disciples. It's a very important subject as we peruse history and as we read the Bible they will blend together as we see the program of God, the gospel of Jesus Christ, the founding of the church in Jerusalem, and how it came west. Now the subject at hand is very important because unless we know these things there's a lot of gaps in our knowledge and there will be a lot of gaps in our Bible understanding unless we know what happened actually during the Book of Acts and following the close of the Book of Acts as we read it in our Bible.